Those of you who have been following the game since its early days might already know how the multiplayer works. The basic idea is that (depending on the game-mode) every player has a crown which he has to protect. To win the game, the player has to shoot down the crown of his opponent. Therefore, you have to build defences and weapons out of blocks. At the beginning of the game, each player has only some wood and stone which are the weakest materials in the game. In order to get more and better resources, you have to build producers. These must be placed near the resources which are randomly generated around the crown (actually, it’s an algorithm that determines fitting positions). These producers can be upgraded which improves the production speed. 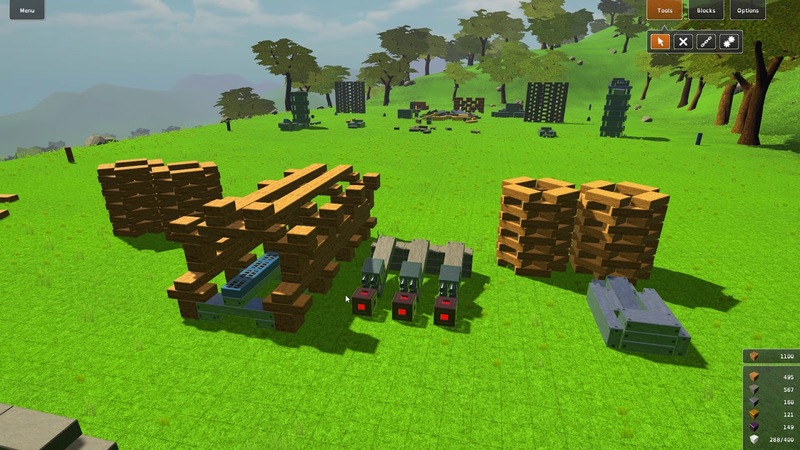 Accelerator: Block with rolls, used to shoot blocks away. The higher the speed, the higher the energy consumption. Rocket: Block with rockets on the side, can push itself and other blocks forward. Trigger: Block with detector attached to it. Can be connected to other blocks which will then be activated if something enters the detector field. Gate: Used to forward signals from the trigger. Can also perform logical operations. If you compare the multiplayer mode today with how it was about a year ago there have been several changes. First of all, I removed the conveyor belts together with the whole transportation mechanic from the game. The reason for that is that after several test games I came to the conclusion that I looks nice but it doesn’t really add something to the game. It even made everything more complicated, especially if you have just started to play the game. Next, I added resources-objects to the floor which adds a little bit of randomness to the game and prevents players from building all the producers at the far end of the playing field. Previously, I’ve added numbers to the sides of producers and other blocks which gives a better overview. Besides the crown defence mode, there is the tower construction mode in which the players have to build towers of a specific height. Once a player has a tower that is high enough, he has to defend it for 2 minutes in order to win the game. I’m planning to add a special version of the crown defence game mode in which you have unlimited resources. To prevent players from spamming things, there will be a block limit for each player. In addition, there will be attack and construction phases so that you have to plan carefully how to deal most damage during a small time window. There are also plans to implement a 4 player multiplayer map (1v1v1v1 or 2v2) but that might cause problems on slower internet connections as the synchronization of blocks generates much traffic when there are many blocks moving at the same time. Besides the competitive multiplayer there is of course also the multiplayer sandbox mode where you can build and do whatever you want. I’m still working on the singleplayer levels while improving smaller things and fixing bugs. After that I will continue to work on the Steam integration which I hope won’t take too long. I'll post more news regarding the beta in the next weeks.